The association Our Lady of the Holy Face was born on December 13, 2013 with the aim to divulge the worship and the veneration of the Face of Christ of Manoppello, especially in its overlapping with the Face of the Crucifix in the Holy Shroud, according to the realization of Sr. Blandina Paschalis Schlömer. The association is headquartered in Manoppello, behind the Basilica of the Holy Face, on the hill in Via P. Domenico da Cese, 1. We want to offer the pilgrims of the Holy Face through our services the opportunity to deepen and interiorize the experience with the Holy Face of Jesus Christ in the Veil of Manoppello guarded in the Basilica above the main altar. A fleeting greeting, a hasty kiss or a short prayer dedicated to the Holy Face can not be enough to fully understand the true sense of this presence. 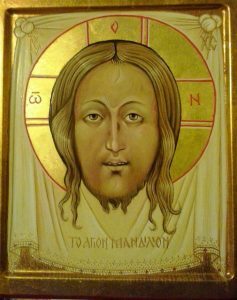 The Face of Christ requires silence, meditation, listening, and longer prayer times to deeply receive the Lord's heart. We offer guidance in Basilica and other places prepared for the purpose of deepening. As a first approach to deepen the facts and knowledge about the Holy Face we have set up a permanent exhibition titled "VIA, VERITA ', VITA", The Holy Face of Manoppello" in the heart of the village of Manoppello in Piazza Marcinelle.